Program is designed for all people who are interested in their health and who want to keep in order all medical records. You get 5 gigabytes of storage space for your medical information. 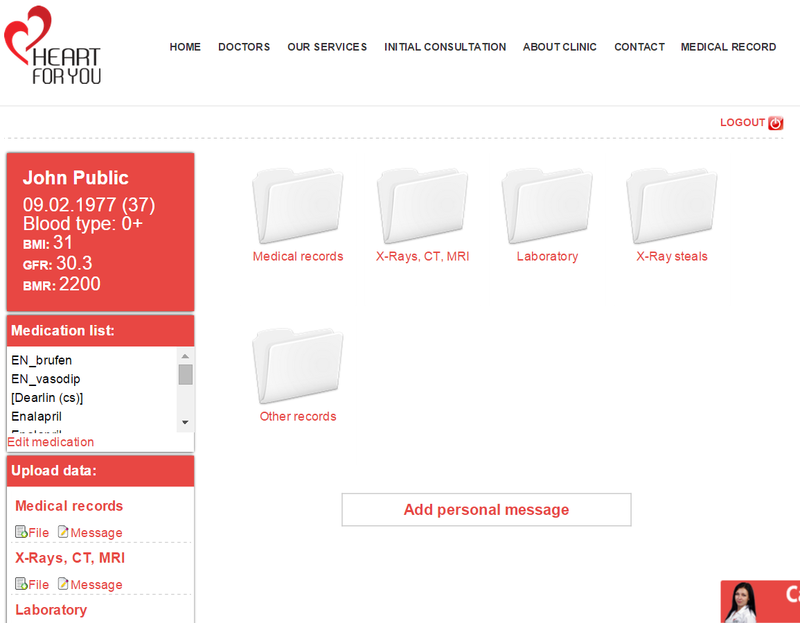 “My Account” is divided into folders and for ordering and your convenience the folders: “Drugs,” “X-rays”, “CT scans and MRI”, “Documents” and, of course, “Doctor’s opinions” were created. All data can be stored in the form of images and in the form of text. You can download copies of your documents as files or just paste the copied text, it is very simple as in the document «Word». Information can be copied to any electronic gadget: computer, tablet, phone and simply inserted into the “My Account”. You can upload discs with CT and MRI in full without compromising quality. Folder for recording blood sugar and pressure will help you keep records of your blood glucose level and your pressure. For patients with high blood pressure it helps in monitoring and treatment of hypertension. As well as the patient can create records in the same table,by advice of treating physician and for balancing blood pressure. A patient suffering from diabetes can create tables and equated to the BMR by the help of attending physician and for balancing diabetes. For your convenience after the transfer of any information into “My Account” you can add a title or description. “My Account” is available at any time and anywhere in the world, so you have an opportunity to shuow or download documents from it whenever you want. Beside you can put all your medical history into “My Account”. If you perform laboratory tests and bring their results, including: height, weight, age, you can get your: BMI (body mass index), the amount of energy consumed by your body, as well as information on the functions of your kidneys. This information may be helpful to maintain your ideal weight for the proper use of medications. Especially this is useful for people suffering from diabetes mellitus as it helps to avoid hypoglycemia. Any patient who is being treated at the clinic receives “My Account” for free of charge for a year. A patient who uses the program “Personal Physician” gets “My Account” at the time of treatment and three months after, as a gift for free of charge. Patients who undergo examination at the clinic also receive “My Account” at the time of the survey and three months after the survey as a gift for free of charge. ATTENTION! Participants of the program of blood glucose and blood pressure monitoring gets an access to “My Account” free of charge for 1 year. Users of “Internet services” are provided with the access to “My Account” free of charge for 6 months. Besides after the end of treatment your data will be kept in “My Account” and provided at your disposal if necessary after your request for access to documents in the “Account”.